Seven Stories Press, 9781583226377, 280pp. 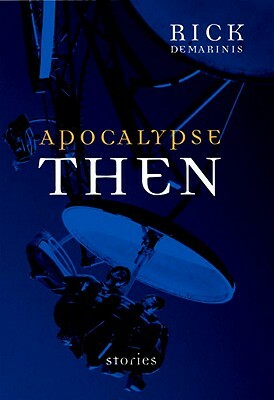 Despite the world’s insecurities, the most common drama of all is not of apocalypse now, but of apocalypse deferred; the pain of living is having to wait it out. In Apocalypse Then, DeMarinis’s characters try alcohol, they try travel, and (most of all) they try off-limits love. They find themselves in harm’s way, or put themselves there—but in life, as the title story states, "sometimes the worst doesn’t happen." RICK DEMARINIS is the author of several novels and collections of short fiction. His stories have appeared in Harper's, Antaeus, Story, Epoch, and many others. In 1990 he received a Literature Award from the American Academy and Institute of Arts and Letters.